Intaglio printmaking is a printmaking technique where drawings are etched onto a prepared metal plate with acid or sharp tools. Ink is then wiped on to the plate, and sent through a press under immense pressure, so the ink is transferred onto paper. The first intaglio assignment, to start our understanding of how the printmaking process worked, was a simple print involving only hardground lines. Hardground is simply covering the plate in hardground and drawing lines in it—where the ground is scraped away, the acid will etch. 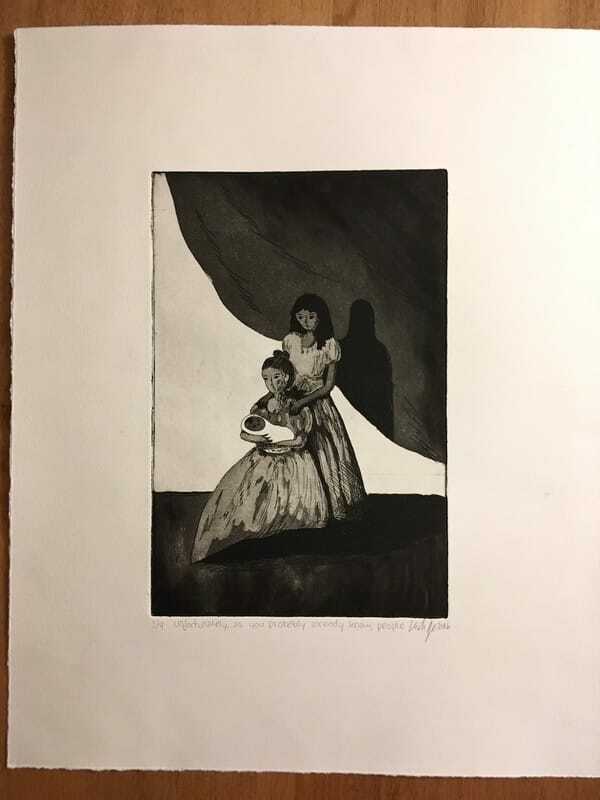 The second assignment was to introduce us to the concept of aquatint—covering the plate in rosin dust, melting the dust onto the plate and etching it, stopping-out areas, and etching it again (a process called stage-biting). The assignment was also to introduce us to a famous historical intaglio printmaker—Francisco Goya and his Los Caprichos prints. The assignment was to choose a tweet from Twitter and illustrate it using the intaglio methods of hardground line and aquatint. For the third assignment, we learned how to use softground for line and textures. Softground is similar to hardground, except (as you might guess) soft. By coating the plate in softground, you can impress various materials in the ground and peel them off, which peels off the softground in the same texture as the material. 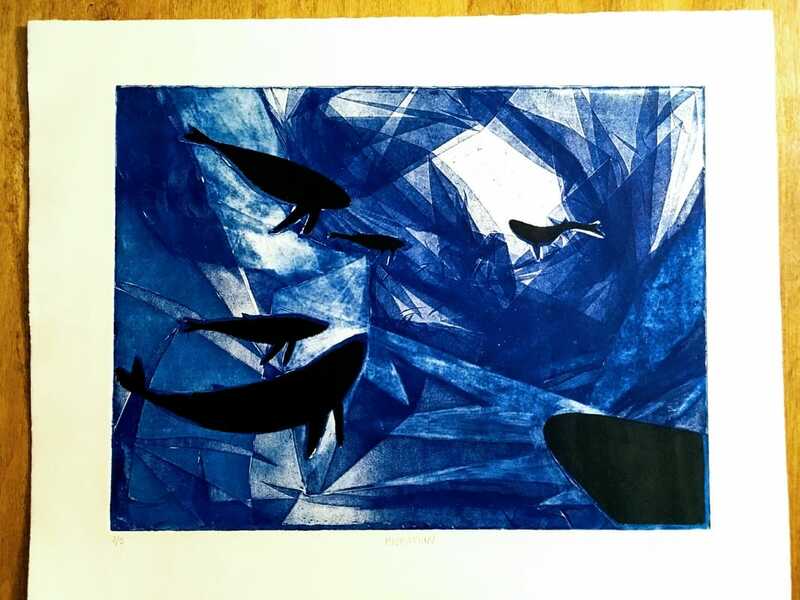 Additionally, for this project we were introduced to several printmaking processes that didn't involve changing the state of the actual copper plate—by using stencils and the printing ink, we could acheive a more varied set of results than just by printing the wiped plate. The fourth print was to practice drypoint—scratching a design into the copper plate without the help of acid or anything besides your hands and sharp tools. Each person in the class got a small piece of a larger photograph, and had to reproduce their piece onto a copper plate with drypoint. Then during two consecutive printing days, we put all the small plates together and printed the large image together. The final print for this class was to use two plates together somehow. We were allowed to use the two plates however we wanted: I opted to register the two plates (print them on top of each other). The design I came up with had very tight registration on the eye in the middle, and was a satisfying challenge to undertake. It was also a lot of fun to utilize many of the techniques we'd learned over the semester in a single image.